When you decorate your bathroom, it is very important to make sure that toilet paper is kept close to the toilet, so that it is always in easy access when you need it. Today, there are many toilet paper holders available on the market. They are a great option for storing loo rolls, as well as for dispensing toilet paper. If you like reading on the loo, you might consider purchasing one of the best magazine holders , as their construction often includes holders for toilet rolls. Look through our guide and reviews to find the best toilet paper holder. Wall-mounted. These holders are the oldest and most traditional of all types. They are attached to the wall with the help of screws or suction cups. There are also self-adhesive wall-mounted holders that come with a sticky backing. Freestanding. They can be placed wherever you like. Usually, they are placed close to the toilet. The construction of such holders contains two parts. The function of the lower part is storing loo rolls (most models can store up to three rolls), while the upper part dispenses toilet paper. Tank-mounted. They are also called over-the-tank holders. They are fixed to the toilet tank. Such holders usually store one or two rolls of paper. Recessed. These holders are the most popular for industrial use. They are built in into the wall. They can hold and dispense only one roll at a time. They are mostly made of solid and durable materials, preferably metals, as they are installed in toilets with heavy traffic. Mounting type. Choosing the type of installation you should take into consideration where you want to install the holder. The size of the bathroom also matters. If your bathroom is of rather a modest size, a wall-mounted or tank-mounted holder is just the thing for you. If there is some free space in the bathroom, you might consider installing a freestanding unit. Number of rolls. Toilet paper holders usually hold up to four rolls. Freestanding holders can store more rolls than the other types. Over-the-toilet models can hold no more than two rolls. Wall-mounted and recessed units are usually single-roll. Material. Make sure that the toilet paper holder you choose is made of a durable material. There are models on the market made of aluminum, brass, glass, iron, stainless steel, and wood. Finish. Make sure that the finish of the holder corresponds the finish of the other fixtures in your bathroom. They come in a variety of finish colors. The most popular of them are chrome, stainless steel, nickel, silver, bronze, brass, white, and black. Brand. The market is filled with multiple models from the best manufacturers of bathroom fixtures. The most popular among them are Moen, Kohler, Delta, Grohe, Danze, and Kingston Brass. 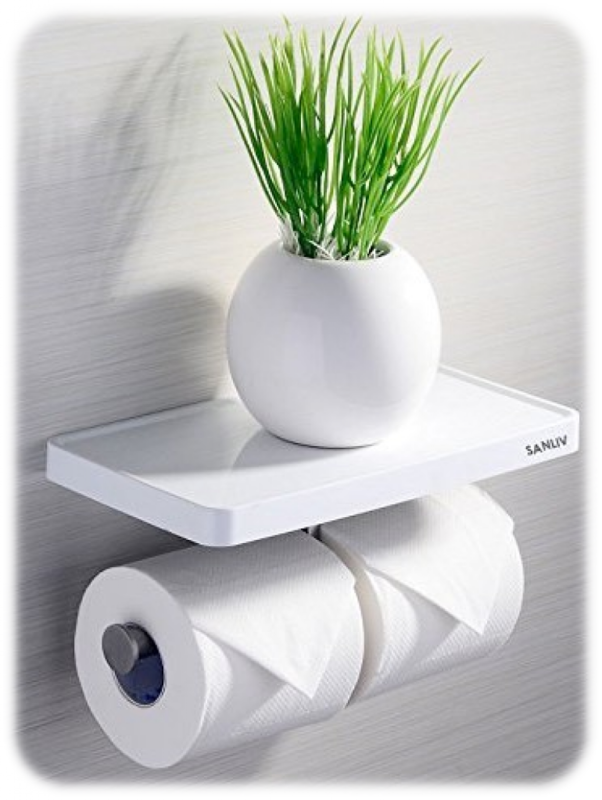 This stylish and functional toilet paper holder will be a nice addition to any bathroom. Its beautiful design with soft lines looks sophisticated yet not too chic, which makes it look well in any bathroom setup. This model can store three rolls of toilet paper and dispense one. This toilet paper holder from Deco 79 comes in two finish colors – reddish/bronze and white. The dark reddish bronze color will look especially interesting in a bathroom decorated in antique or traditional design, while the delicate off-white color is neutral enough for any bathroom décor. 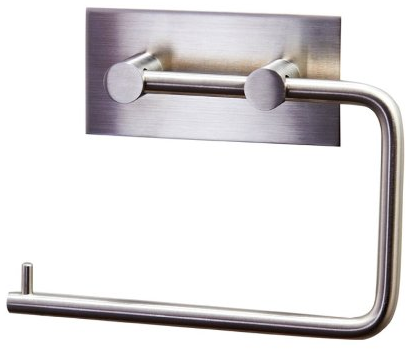 This high-quality holder will be an excellent choice for any bathroom. 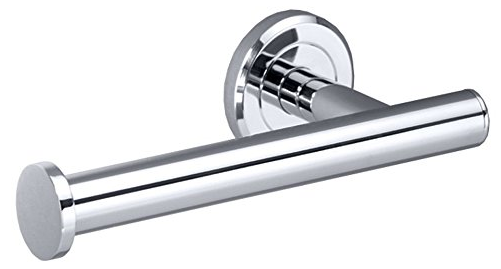 Made of stainless steel, it is durable and rustproof, which is especially important when it comes to the choosing an accessory for the bathroom. A unique compact design of this unit will make sure that toilet paper takes as little place as possible. The glossy chrome finish of the Classico Roll Sand Plus from InterDesign will add a special vibe to your bathroom. It can store three rolls of paper and dispense one. It can hold standard and jumbo rolls. Thanks to the design with raised feet, the toilet paper will not come in contact with the floor. 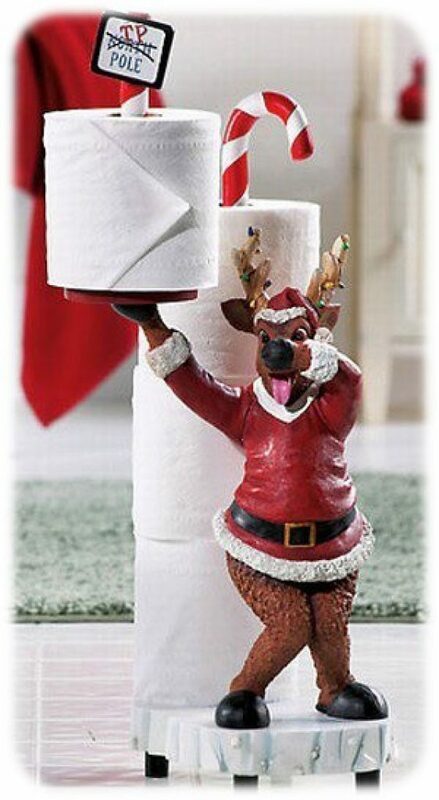 This is another great freestanding toilet paper holder. Its elegant design with beautiful lines will go well with a bathroom decorated in any style. You can choose out of three finish colors – bronze, chrome, and satin nickel – to find the best match for your décor. This freestanding holder from Franklin Brass is compact enough to fit next to the toilet even in bathrooms with limited space. Thanks to the steel construction, this model is light and durable. It works with most brands of toilet paper. It can store two rolls and dispense one. This is one of the best wall-mounted toilet paper holders available today. Its one-arm single-post design allows changing rolls quickly and easily. The installation of the holder does not require many efforts – it is attached to the wall thanks to a stamped steel bracket, strong and durable. The Preston holder from Moen comes complemented with a template and all the necessary mounting hardware. 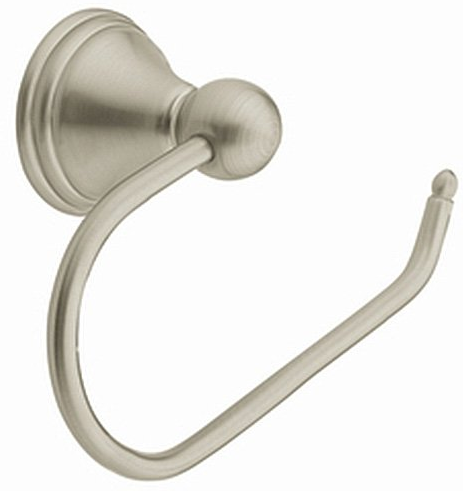 This model is available in two finish colors – chrome and brushed nickel. Apart from all those advantages, it is easy to clean thanks to the unique Spot Resist technology that repels water spots and fingerprints. This self-adhesive holder is a great option for those who do not want to spend any time or efforts on the installation. It comes with a sticky backing, it can be mounted quickly and easily- just remove the protective layer and press the template to the wall. The Tissue Roll Hander from KES comes with two mounting template shapes – rounded and rectangular. Its durable and rustproof stainless steel construction will make sure that the holder maintains its looks and quality for a long time. Coming in two finish colors – chrome and nickel – it looks modern and minimalist. This holder is a stylish accessory that will bring a fresh accessory into your bathroom. It belongs to the Latitude II line of products that is characterized by special attention to quality and style. This model comes in several finish colors including chrome, matte black, matte brass, and satin nickel. The European Tissue Holder from Gatco can be attached to a wide range of bathroom surfaces, including tile and drywall. It is complemented will everything you need for the installation, including mounting hardware and detailed instructions. Its sleek design with beveled edges includes a mounting template with concealed screws.